Nicola: I know you come from a long line of women, seamstress’s, embroiderers and homemakers, and that Nellie and Eve is named after your grandmothers. Can you tell us more about the journey you took to beginning your business? Helen: From a young age I have always been a maker, taught by my grandmothers and mother, I made clothes for myself and friends and pressed flowers in a press made by my father, which progressed into a range of hand produced greetings cards years later. 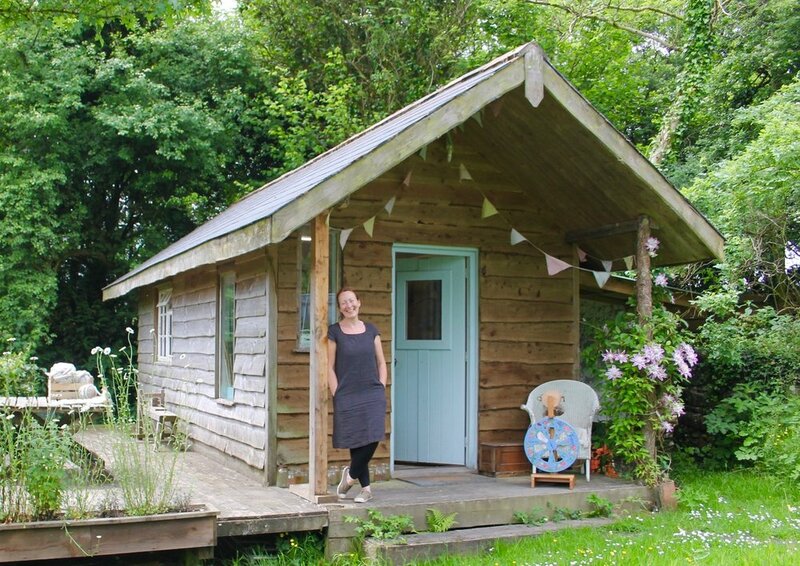 I indulged my love for antique quilts and vintage fabrics for several years, but it was when I moved to Wales 15 years ago that I found my true place in the countryside. A friend invited me to join her at the local spinners, weavers and dyers group held in the village, and from that day I was hooked on wool in all its glory. Actually making yarn from a raw fleece appealed to my love of all things natural and making completely by hand. Spinning yarn is still my favourite thing to do, it’s a gentle, mindful way to make something that has so many uses. I wanted to help promote the many overlooked uses of this sustainable fibre, and to pass on skills I had learned …. 'Nellie and Eve’ was born. Nicola: Your products are all made by hand in your workshop and reflect your love of a homespun lifestyle. Can you share with us what a homespun lifestyle means to you? Helen: Homespun for me means making, baking and growing your own. Not buying new all the time, make do and mend, and treading gently on the land. Nicola: Why is it so important to you to use locally sourced fleeces? Helen: I live in Wales, surrounded by sheep with lovely wool on their backs. There is no need to go elsewhere for this natural, sustainable product. I know where it's farmed, I see how the sheep have been looked after, and that's incredibly important to me. In my own small way I'm helping my local community. Nicola: We’d love to know more about the process of how your work develops from initial idea to the final piece. Helen: It always starts with fleece. Depending on what I want to make, I will first wash the fleece in an old tin bath by hand in the garden. The wool is then left to dry naturally, before being carded (or combed) using a hand cranked carding machine. This process results in a smooth, airy wool batt which I can then spin into yarn or weave. I spin the yarn using one of my six spinning wheels, each one helps me achieve different results and weight of finished yarn. They all have their place, really they do! I can spin up to 500 grams of yarn in about half an hour on one of them! But it usually takes a full day to have a spun, plyed skein (200g) that’s ready to be used in a knitting, weaving or crochet project. 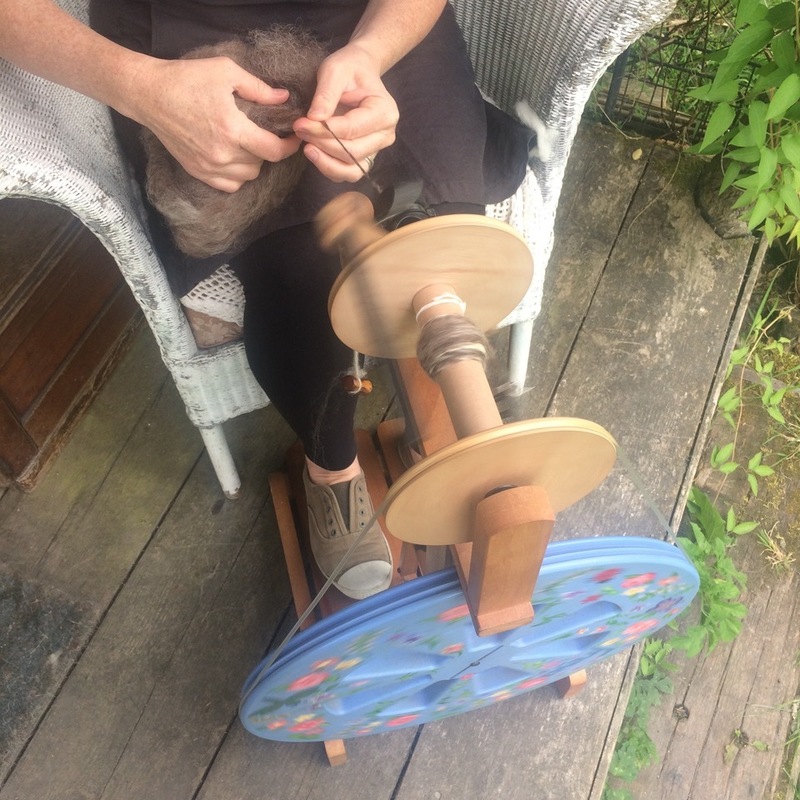 The wheels are also an essential tool when running ‘Learn to Spin Yarn’ workshops at my studio. I use locally sourced super soft Shetland and Blue Faced Leicester as well as Jacob wool for my online hand spun yarn collection. If I want to add some colour to my collection, I will pick plants from my garden or the hedgerows and use them to dye with. It's a long process to get to the point of knitting a jumper, or weaving a rug but I wouldn’t have it any other way. It's a labour of love and a lifestyle I enjoy; slow living. Nicola: Can you tell us more about the workshops you run? We’d love to know whom they are for and what it is you teach? I run workshops in crochet, knitting, peg loom weaving, plant dyeing and hand spinning….all the things I love to do myself and that are fun to teach. I teach at various venues and festivals as well as my studio and love the interaction and connection with people that want to learn new skills. I teach anyone who wants to have a go, young or old, all are welcome. It’s incredibly rewarding, especially when I got a call from a customer saying that the only thing on her son's Christmas wish list was a loom and some wool. I had taught him to peg weave at a summer festival and was thrilled, this makes it all worthwhile. Nicola: We’d love to know more about where you live, your workspace, and what a typical day is like for you? I live on a hill in rural Carmarthenshire, south west Wales. My husband built my studio which sits nestled in the garden surrounded by fields of sheep, some of which provide me with fleeces. A typical day for me will always start with coffee and a walk with my dogs, followed by checking emails and perhaps posting on social media. That’s when the typical day ends as my work is so varied. I may be packing up orders, preparing for an upcoming event or workshop, dyeing yarn with seasonal plants or swatching a new design, but at some time during the day I will always make time to spin some wool. Helen: Follow your heart – it’s your true you - and stick with it. Keep it simple, honest and mindful. You can find Helen at www.nellieandeve.co.uk, or follow on Instagram, Twitter and Facebook.